If an effortlessly easy, non-invasive facelift from the comfort of your sofa sounds good to you, read on… That’s what this ingenious device offers, thanks to advanced ‘microcurrent’ technology (often referred to as a ‘natural facelift’). It emits extremely low-voltage electrical currents that mirror your body’s own natural currents, stimulating collagen and elastin production and repairing skin. Receiving reams of rave reviews, this innovative tool tones skin to improve your facial contour, giving a visible ‘lift’ while minimising wrinkles and working towards more radiant, youthful skin. In as little as five minutes a day, you’ll reap miraculous rewards… This smaller edition packs all the benefits into a petite, portable and powerful device, perfect for on-the-go use or for an introduction to microcurrent technology. If you’ve never heard of a microcurrent facial, you might be interested to know that they are often referred to as ‘natural face lifts’ – and you might be even more interested to know that you can now achieve one at home with NuFACE’s ingenious Trinity Facial Toning Device. Emitting extremely low-voltage electrical currents that mirror your body’s own electrical currents at a cellular level, this cutting-edge tool repairs damaged skin and stimulates collagen and elastic production, miraculously reducing signs of ageing. Effortlessly easy to use in as little as five minutes, you simply apply a gel primer (included), adjust the intensity and glide along your brow, cheekbone, forehead and jawline areas to lift, tone and contour. NuFACE’s clinical tests have proved that the device improves the facial contour, as well as minimising wrinkles and leaving skin even and radiant. The rave reviews that have poured in are a testament to this device’s extraordinary efficacy – you need to see it yourself to believe it. N.b. This device comes with a USA, two-pin plug. Some customers may require a plug adaptor. 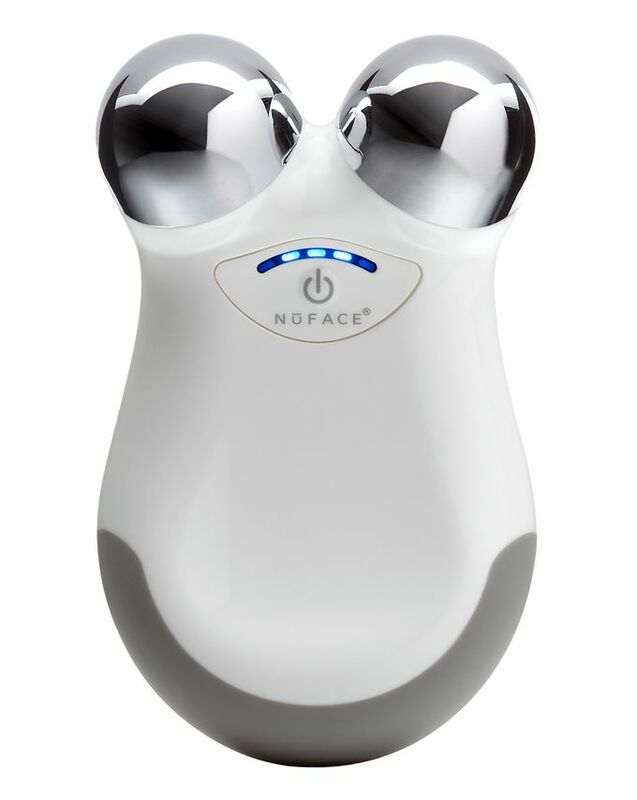 The NuFACE trinity facial trainer is an FDA-cleared microcurrent treatment attachment for the NuFACE Trinity. Step 1: Prep! Cleanse the face with an oil-free cleanser, removing any makeup oils and impurities and apply the NuFACE gel primer to the left cheek area. Apply the gel in a mask like layer so that the skin appears wet. Press the on/off button to power the device on. Press the intensity control button until you reach the maximum level. Intensity can be adjusted for comfort at any time. Step 2: Lift! Place both spears on position one and glide to the lower ear until the beep sounds. You will hear the audible treatment timer beep every five seconds. Move to position two and glide. Move to position three and glide. Return to position one and repeat the facial lift treatment two more times. Next, apply the gel primer above the left brow. Place both spheres on position one and slowly glide to position one until the beep sounds. Move to position two and glide. Move to position three and glide. Return to position one and repeat the sequence two more times. Lift half of your face and compare the treated side of the face to the untreated side of the face, and look for skincare improvement in the brow, cheekbone, and jawline areas. Now apply the gel primer to the other side of the face and continue the facial-lift treatment as described above. Step 3: Finish! Power off the Trinity toning device and place on the charging cradle after every skincare treatment. Remove the gel primer with a damp cloth and apply your favourite NuFACE serum or continue with your normal skin care routine. Use five minutes a day, five times a week for the first 60 days. After 60 days, use two to three times a week to maintain the results. I’ve been using this for just over a month and it’s made a huge difference to my skin. To be fair I have been using it about 6 days a week, twice on some days, but it’s been worth it and I’ve had a few people comment that I look really well and that I’m glowing. Initially I could see a real lift each time I used it, now it’s having a cumulative effect and therefore I see the lift most of the time. I will be using this product for a long time to come and think it’s great value. I started breaking out! Am I the only one? I did not even use the junk gel that comes with it, (not here to preach, so if your interested do your own research) but an organic oil free aloe vera gel. Stopped using it altogether for now, as soon as my skin is back to normal I´ll give it another try to see if it actually caused this. Will update! Really good gadget, with good results. Nu face is part of my daily routine. Not only me but also other people noticed a visible difference in my skin. The truth is that I also use 4 times a week the NuFACE LED with the NuFACE toning device and truly my face is more luminous, tightened and brighter. I began to use it regularly since late February 2018 and after 5 weeks approximately the results were so visible that I started receiving amazing compliments. Careful I use the toning device 6 times a week and the LED device 4 to 5 times a week. It really works at least it worked for me. Highly recommend it, it's a fab gadget which has done wonders for my skin! I so wanted this to work - and it did! I’m just 40 and although I’m not yet wrinkly, my face has dropped over the past year - jowls, marionette lines, lost definition of jaw and cheekbones... this little gadget though has really tightened everything up and improved the overall texture of my skin. I definitely notice a difference. Even my husband said I look ‘fresher’ - and he never notices anything. I have been using it every day for about 20 minutes, I use a little hand clicker to make sure each side of my face gets the same attention - it’s time consuming and a bit tedious but I can never stop now for fear of reversing the results. Must buy product on earth! Something magical.